Imagine having your dream job. 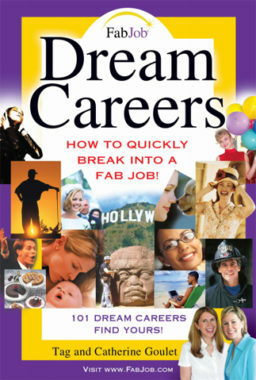 You can discover how to make your career dream come true in the book Dream Careers: How to Quickly Break into a Fab Job! by Tag and Catherine Goulet. if you have no idea which career you should choose. At the end of each chapter, a detailed 'How to Break In' section offers advice on how to break into all the dream jobs in the chapter and in those fields. 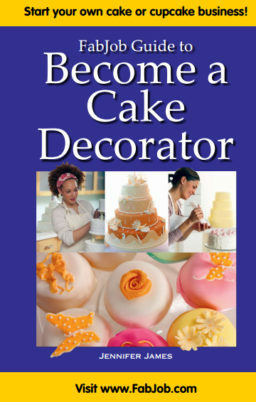 For example, the 'How to Break In' section of the Entertainers chapter explains, among other things, how to get professional photos, how to create a demo, and how to get an agent. See below for a detailed list of topics and careers included in this 364-page guide. 'Dream Careers' authors Tag and Catherine Goulet are the leading experts on how to break into a dream career. Founders of FabJob.com, they have been featured in media from ABC to Oprah.com and from Woman's Day to the Wall Street Journal online. As dream jobs experts, their career advice appears frequently in newspapers throughout North America and online at AOL.com, CNN.com, and MSN.com. Shortly after it was published, 'Dream Careers' ranked # 1 in career and business books at Amazon.com. You can have the valuable information in this bestselling career book for an incredible special price. Some people pay hundreds of dollars for career coaching. 'Dream Careers' contains some of the best career advice you could get from other sources, and more. (1) Which dream jobs have the millions of visitors to FabJob.com told us they most want to break into? (2) Which dream jobs can you break into quickly (without going back to school for a degree)? The fabulous career advice in 'Dream Careers' can be used to help you land a career that you dream of. If there is any chance that you will be changing careers or looking for a job, you will find valuable information in this helpful book. This guide has been selling for up to $19.95 U.S.
SPECIAL OFFER: If you buy the e-book today, you can have this valuable insider information for the incredible price of only $7.97. Why are we selling it for such a low price? Because we believe that after you read 'Dream Careers' you will want to buy other FabJob guides for yourself and your loved ones. With more than 100 FabJob books and e-books offering step-by-step expert advice and insider information on how to break into a variety of dream jobs, we want everyone to know that FabJob.com is the place to come for career books. 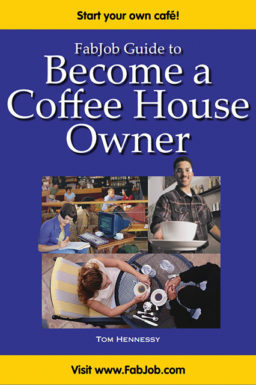 In this part of the book you will get advice to help you find a dream job that’s ideal for you. Tag and Catherine act as your facilitators, asking you questions, giving you advice, and providing fun and insightful quizzes to help you identify your dream career. Chapter 1. Where Are You Now? How to determine if you are ready for a new career. Chapter 2. Where Have You Been? Chapter 3. What Do You Want? Chapter 4. What Is Holding You Back? In this part of the book you will get concrete advice to help you make your career dream come true. This guide is available as an e-book which you can read on your computer. The guide is also available as a print book which includes a CD with helpful samples. You can have the e-book within minutes. Ordering is fast, easy, and safe. Click the “DOWNLOAD NOW” button to get your guide now. FabJob guides have been featured in stories at the Wall Street Journal and Entrepreneur Magazine sites.